In February this year, we were contacted by a leading animal feedstuffs supplier to quote for some repair works on their mains water supply. Based in North of England, the firm has been serving farmers across the UK since 1900 and are a fourth generation owned family business. The job arose because the firm had been audited by the local water authority and needed to fix some compliance problems. Upon visiting the site, the owners revealed the site had a pre-existing borehole that had never seen use. Drilled around 15 years ago, the company were informed, incorrectly so, that the borehole was not fit for the purpose. That misinformation had been taken on board, and the borehole consequently sat unused. After quoting for the repair works, our engineers decided to take a closer look at the borehole. Our team agreed that it could be brought into use relatively quickly and would yield more than enough water required for day to day operations. The option to use it was then put on the table, with full costings and estimated payback period calculated after the initial capital expenditure. After receiving the go-ahead our team brought the borehole to life. Modernising some of the technology in the borehole itself alongside installing a custom water treatment and storage system. The job included the installation of two 10,000 litre storage tanks and a pumping house that boosts and treats the water via UV filters. 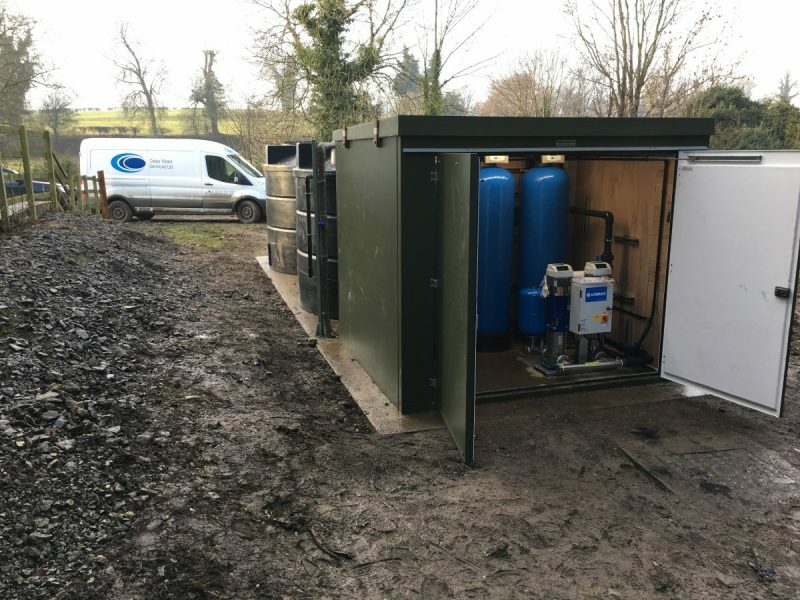 The firm now has a fully functioning borehole to use daily in their animal feed production, a more reliable water supply and a private system that removes the compliance problems they had to deal with on their mains water supply. Our engineers also installed a mains connection, with a type AB air gap. An air gap is needed to stop borehole water mixing with the mains water and sits directly below the water discharge point. The firm have since be re-audited by the local water mains water supplier for compliance and passed with flying colours. The Dales Water service team have also been hired to provide ongoing maintenance to the borehole to ensure it’s in tip-top condition throughout the year and if there are any problems, they’re dealt with pro-actively. If you work in the agriculture business and have an existing borehole or feel one might be beneficial to your business, don’t hesitate to contact us for advice and additional information.